Horsely Hills, or “Andhra Ooty” as it is called, is a small beautiful hill station in Andhra Pradesh, India. It is half an hour drive uphills from Madanapalle town in Chittur District. The ghat route to Horsley Hills is very scenic, with wild animals like bear coming out to the road at night. It is filled with flora and fauna and trekking is a major attraction here in Madanapalle hill station. Madanapalle is a shooting location for many Telungu movies , especially for songs. Horsley Hills is one of the few tourist places in India that offer Zorbing, i.e. rolling down the hill in transparent plastic robs. Ooty lake has something remotely similar to this (getting inside the transparent air filled ball / balloon in the small pond at the entrance to lake) for kids. Koundinya Wildlife Sanctuary, a migratory Elephant Sanctuary, is located at a distance of around 85 kilometers away from Horsely hills. World’s largest Banyan tree, Thimmamma Marrimanu, is in this wildlife sanctuary. Horsley Hills is not very cold unlike other hill stations and not much of commercial activity is found here. One Residential school is there on top. View of the valley from top is excellent. I visited Horsley Hills near Madanapalle in 1996 and cherish those memories. We started from Chennai in the morning and picked up a few friends on the way, at Chittor and Madanapalle, and reached the hill station in the evening. We stayed at the government guest house (PWD guest house, if my memory is correct) on the hill top. There is a small hotel on top, owned by a Mallu family from Allappuza (previously known as Alleppey). That was the only hotel there that time. Rishi Valley School is a famous school on a ‘Special Development Zone’ called Rishi Valley Special Development Authority, as declared by the state government in 2008, to conserve its rich and diverse environment from becoming degraded. How Do I Go to Horsley Hills Near Madanapalle? 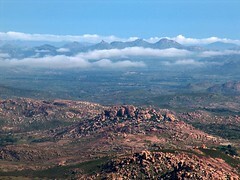 Horsley Hills is at a distance of 140 kilometers from Bangalore and around 275 kilometers from Chennai. The nearest railway station is Madanapalle Road, at 13 kilometers away. There are a lot of hotels at Madanapalle.